After a freak shopping cart accident, Brigid Fitzpatrick takes stock of her life and wonders what happened. Determined to reinvent herself, Brigid sells off everything and rents a cottage in the small town of Alpine Grove. Thanks to her military widow’s pension, she can take a much-needed summer vacation. Armed with piles of self-improvement books, Brigid sets out to rebuild her life. 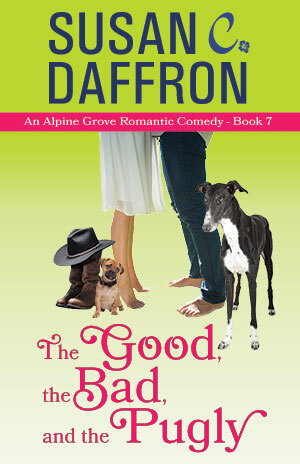 When she adopts a sweet little dog named Gypsy, Brigid finds out Gypsy isn’t the only homeless dog in Alpine Grove. Compelled to help animals with nowhere to go, Brigid forges a plan when compassionate horse trainer, Clayton Hadley agrees to help. Forced to face deep-seated fears, Brigid finds herself intrigued by Clay’s uncanny insights. Plus, how often do you get to meet a real life cowboy?